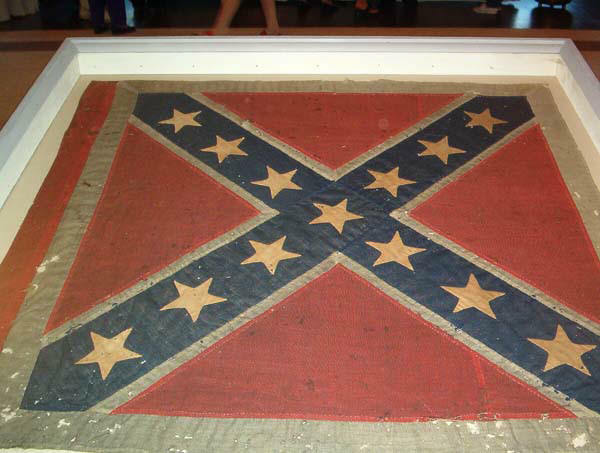 A photograph of the original flag for Co. H, 50th GA Volunteer Infantry "Colquitt Marksmen". Taken while on display in Moultrie, GA for the 100th anniversary of the local UDC Chapter. The Flag about 48" square, one side has a sleeve for a pole, not the standard ties and is of cotton bunting. Note the orientation of the stars. John A. Alderman a third cousin three times removed was born on 15 June 1827 in Bullock Co, the son of William Alderman and Sarah Edmonson. On 15 February 1849 when John was 21, he first married Emily Susan Norman, daughter of James Mitchell Norman & Ruth Tillman, in Thomas Co, GA. She was born on 24 March 1826 in Lowdnes Co, GA. and died in Colquitt Co, GA on 9 August 1868. John second married Susan Alderman who was born on 16 October 1838 and died on 27 January 1917. John was a member of Company H. He had has left arm permanently disabled, resulting in partial paralysis, at Fredericksburg, VA on December 1862. National Archives Microfilm Box, Roll, and Record: 000226, 0001, 00002264 GA. John A. died in Colquitt Co, GA in 1907. William Alderman, a fourth cousin two times removed was born on 23 April 1824 in Duplin Co, NC, the son of George Alderman and Nancy Carlton. On 8 January 1850 when William was 25, he married Catherine Wells who was born on 4 January 1821 in NC. Catherine died in Brooks Co, GA on 27 June 1891. William enlisted as a private 4 March 1862 in Company K and died in Savannah, GA in April 1862 at the age of 37 at Camp Davis near Savannah, GA. National Archives Microfilm Box, Roll, and Record: 000226, 0001, 00002278 . John Bradford a second cousin four times removes was born in 1820 in Lowndes Co, GA the son of William Bradford and Elizabeth Griffin. John first married Elizabeth , maiden name not know. On 13 January 1858 when John was 38, he second married Nellie Jones, daughter of Abner Jones. John was a member of Company D. He enlisted as a private 4 March 1862. He was wounded at Cedar Creek, VA. On 19 October 1864. National Archives Microfilm Box, Roll, and Record: Not found at this time. John W. Bradford a third cousin three times removed, was born in 1845 the son of Shadrack Bradford and Catherine Johnson. John was a member of Company D enlisting 4 March 1862. He died in service to the CSA in VA. 1863. National Archives Microfilm Box, Roll, and Record: Not found at this time. Richard Lott a Great-Great-Great Uncle was born 17 April 1840 in Telfair Co, GA the son of Daniel Lott Sr. and Caty Bown. Richard married Elizabeth "Bettie" Peterson (my second cousin three times removed) daughter of Henry "Hal" Peterson & Martha "Patsy" Gaskins. Elizabeth was born in 1843. Richard served as a private in Company C. He died 20 May 1862 in service to the CSA from measles in camp the near Savannah, GA. National Archives Microfilm Box, Roll, and Record are not found at this time. Daniel McMillan was born on 23 November 1837 in Irwin Co, GA. GA the son of Malcolm McMillan and Rachel Sumner. On 1 November 1860 when Daniel was 22, he married (my first cousin four times removed) Margaret Paulk, daughter of Thomas Paulk & Nancy Henderson, in Berrien Co, GA. She was born on 19 March 1839 in Irwin Co, GA and died in Coffee Co, Ga. on 9 November 1913. Daniel enlisted as a private in Company I on 28 August 1862. He died from wounds suffered in action in Virginia on 13 March 1863. He is buried at Farmville, VA hospital cemetery. National Archives Microfilm Box, Roll, and Record: Not located at this time. Lewis Sirmans a second cousin four times removed was born about 1840 the son of David J. Sirmans and Eliza Wilkerson. Lewis married Rachel Lightsey, daughter of Jacob Lightsey, & Christina Rice, born on 24 October 1840. Lewis joined company G and died in service to the CSA before 1865. National Archives Microfilm Box, Roll, and Record: not found at this time. Lyman A. Sirmans a first cousin five times removed was born in 1838 the son of Benjamin Sirmans and Martha Johnson. In 1861 when Lyman was 23, he married Mollie Griffin, daughter of William W. Griffin & Ann Veal. Lyman enlisted in Company G as a private 27 April 1862. He was listed as missing in battles around Crampton's Gap, MD 14 September 1862. He was never seen again. National Archives Microfilm Box, Roll, and Record: not found at this time. Thomas Tomlinson a second cousin five times removed was born on 26 June 1828 in Lowdnes Co, GA the son of Moses Tomlinson and Charlotte Monk. In 1852 when Thomas was 23, he first married Mary Sirmans, (my first cousin five times removed), daughter of Joseph Sirmans & Rebecca Smith. She was born on 11 September 1830 and died on 9 January 1887. On 29 December 1887 when Thomas was 59, he second married Harty Sirmans (my first cousin five times removed), daughter of Joseph Sirman s& Rebecca Smith. She was born on 29 January 1833 in Lowdnes Co, GA. and died in Clinch Co, GA on 20 October 1896. Thomas enlisted in Company G 4 March 1862. He was wounded in battle, but the date and place was not given. He was paroled in 1865. Thomas died in Clinch Co, GA on 14 August 1897, he was 69. National Archives Microfilm Box, Roll, and Record: 000226, 0061, 00000378. John W. Tucker a first cousin four times removed was born in 1841 the son of Elisha Tucker and Zilpha Williams. John first enlisted as a private in Company D, 2d Regiment, 1st Brigade, Georgia State Troops on 12 October 1861. He was mustered out in April 1862. He next enlisted as a private in Company E, 50th GA Infantry on 22 August 1862. He was appointed 3d Corporal 6 August 1864. John was captured at Saylor's Creek, VA 6 April 1865. He was released at Point Lookout, MD 20 June 1865. Colonel Peter Alexander Selkirk McGlashan (served 31 July 1863 through the end of war). Colonel McGlashan was captured at Sayler's Creek, Virginia, 6 April 1865. He was later released from prison at Johnson's Island, Ohio, 25 July 1865. Lieutenant Colonels: Francis Kearse (served 22 March 1862-2 July 1863, Kearse was killed in action near the Rose Farm Buildings a few hundred yards west the Wheatfield at Gettysburg). William O. Flemming (served 31 July 1863- 22 December 1863). Flemming served as a Major from 24 February 1863 until his promotion on 31 July 1863 and also served as for a time as a Captain. Pliny Sheffield (22 December 1863-28 November 1864.) Sheffield served as a Major from 31 July 1863 until his promotion in December 1863. Sheffield was wounded at the Battle of the Wilderness. The wound required amputation of the right arm on 6 May 1864. He was a former Captain. Captains: John T. Wilson, P.B. Bedford, James T. Bevill, Cicero H. Young, John B. Osteen, Jesse M. Wells, E.C. Morgan. Upon being mustered into Confederate service the regiment was assigned to duty in Georgia, serving in Savannah defenses. Before the 5Oth Georgia regiment was sent to Savannah it was drilled at Camp Davis, which was located outside of Guyton, Georgia. Some of the companies began arriving at Camp Davis on 17 March 1862. On 20 March 1862 the regiment was brigaded along with the 48th, 49th, and 51st Georgia Volunteer Infantry regiments. On the 21 March 1862 the 50th Georgia men were examined by a medical board and on the 22 March 1862 they held elections for field officers. The 50th Georgia Infantry was not found in the opposing forces at the Seven Days Battles in June 1862. They may have arrived too late to be in the fight or were held in deep reserve. The 50th Georgia with Draytons brigade, passed through Boonesborough, a small town at the western base of South Mountain, around noon on 14 Sept 1862 on their way up the mountain to Turners Gap. When they arrived there, they were quickly redirected one mile to the south to Fox's Gap where a vicious action had been fought that morning between Samuel Garland's Brigade and Reno's Union IX Corps, the "Kanawha Division". General D.H. Hill now directed the four brigades of Generals Drayton, G. T. Anderson, Ripley and G.B. Anderson to align from east to west on the Old Sharpsburg Road which passes through Fox's Gap. Once in position they were order to perform a left wheel driving the Yankees from the fields and woods south of the gap and down the east side of the mountain. Drayton's Brigade was to set up in the gap and serve as the hinge on which all four brigades would swing in the left wheel. Brigadier General Roswell Ripley was directed to command this operation. His brigade and those of the two Andersons moved too far down the Old Sharpsburg Road on the west side of the mountain and lost contact with Drayton's men. When General G.T. Anderson heard firing to his left indicating an assault on the 50th Georgia and the rest of the Draytons brigade, he attempted to reestablish contact with Drayton's right, but found Union troops in between the Confederate positions. General G.B. Anderson's brigade later moved back up to the far south of the mountain and attacked. His brigade suffered heavy losses, but this action was far too late to help Drayton men. General Ripley's brigade had moved completely off the mountain never firing a shot. This left Drayton's brigade alone at the gap. General Drayton ordered the 50th and 51st Georgia Infantry regiments to take position at the Old Sharpsburg Road on the east side of the mountain. He also ordered the advance of Phillips Legion and 3rd South Carolina battalion into a four acre field south of the gap. The 50th and 51st Georgia quickly began taking oblique fire from their left front from Federals posted at the edge of the woods behind a stone and rail fence. The Federal Generals ordered the 900 man infantry regiment of the 17th Michigan uphill behind and left of the 50th and 51st Georgia. The 51st Georgia position was hit with intensive fighting. Meanwhile out in the field Phillips Legion and 3rd South Carolina battalion had advanced to the woods bordering the field. As they began to penetrate these woods they quickly found themselves surrounded and had to fight their way out. The 17th Michigan with its overwhelming numbers routed the 50th and 51st Georgia out of their positions on the Old Sharpsburg Road bordering the north of the field and opened up on the 3rd South Carolina from that direction causing severe casualties. 1st Volunteer Infantry Regiment, 4th Cavalry (Clinch), 10th Battalion Infantry, 11th Cavalry-State Guards, 20th Battalion Cavalry, 20th Volunteer Infantry, 29th Volunteer Infantry, 49th Volunteer Infantry, 50th Volunteer Infantry, 54th Volunteer Infantry, 61st Volunteer Infantry, 63rd Volunteer Infantry. 64th Volunteer Infantry, and Coffee County Revengers Local Defense Unit.....plus information on researching Confederate ancestors, obtaining Veterans Administration grave markers for Confederate veterans, SCV Iron Crosses and more. The author has donated all profits from the sale of this book directly to the Moultrie SCV Camp to support Confederate History and Heritage preservation programs and the continuing fight to save our Southern Heritage. The retail price is $50.00 plus $5.00 shipping. Not a bad price when compared to single abbreviated regimental histories sold by others "up North" at $8-$15 each or cost of $112-$210 if purchased separately and having much less detail! Discounts for current SCV & UDC members (20% off) and for bulk orders, schools, libraries, and teachers. Please contact the camp for discount information. If you are interested send a check or money order made payable to the Moultrie SCV Camp #674 to: P.O. Box 1213 Moultrie, GA 31776. Please include your name, address, and phone number. Please pass along to others as every book sold goes to preserve our Southern Heritage.